I'm the Head of User Experience and Assessment at UNC Chapel Hill Libraries. For more about me, check out the links below. 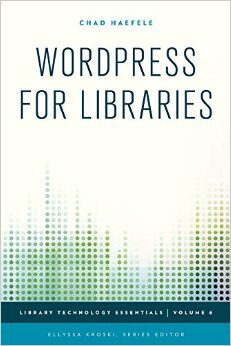 I wrote the book WordPress for Libraries, available now! You can contact me at haefele@gmail.com or @hiddenpeanuts on Twitter. I didn’t get around to posting it at the time, but the recording is freely available! I covered how to use tools like Optimal Workshop, Optimizely, and Marvel to do quick and free usability testing of your site. It’s a beginner-friendly presentation, starting with an intro to just what usability testing is and why it’s useful. The slides are available below, but they probably make more sense if you just watch the recording instead. Windows 10 is almost upon us, just over a day away as I write. Among other new features, I’ve seen article after article talking about the integration of voice controls into Win10. Has their time finally arrived? For a long, long time I was skeptical of voice controls in any context. Way back in elementary school I played with an early version or Kurzweil Voice, and I was impressed if it got more than 10% of my speech right. I think that experience colored my expectations until very recently. My Android phone has had voice commands built in for years, but other than setting timers or alarms I almost never use them. So for a while, I expected my use of Win10’s voice commands to run along the same lines: I’d think it was neat, play with it for a bit, and then forget about it entirely. Then in February my Amazon Echo arrived, and completely changed my thinking. “Alexa, turn on the lights”: I have two lamps on a wemo switch, which the Echo controls. “Alexa, how’s the traffic?”: The Echo reads me a report of the traffic between my daughter’s daycare and my home, giving me a rough idea of how long I have to make dinner before she and my wife arrive. “Alexa, play NPR”: This one does what you’d expect – it plays a live stream of my local NPR station. Then while I’m cooking, I usually ask Alexa to set a couple timers or add things to my shopping list. Later in the evening I often ask Alexa to play music by a certain band or in a given genre, and then I control the volume by voice commands too. This is all done hands free, while I get other stuff done, and I almost never have to repeat myself or cancel a command the Echo heard incorrectly. We’ve come a long way since my arguments with Kurzweil Voice. 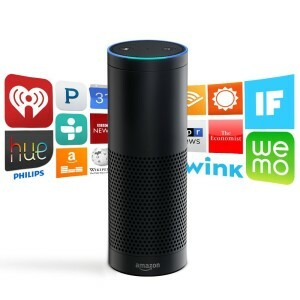 And ok, I’ll admit that I’m on the fence about just how useful it really is to have the Echo turn on lights for me. A plain old fashioned lightswitch is a pretty darn perfect UI already. But using a voice command to trigger lights still delights me in a Jetsons kind of way. Today I do these things on my computer nearly constantly throughout the workday, without the benefit of voice commands. If Windows 10 lets me do them by voice instead, without breaking stride to open another program or dig through settings menus, that’s a bunch of small gains that will add up to a big improvement in how I work. I’m truly excited to try Win10’s voice recognition and see where it goes. Maybe you’ll even catch me dictating an email someday – but probably not in public. Last night at about 11PM there were two armed robberies on campus in quick succession. (Nobody was hurt, thankfully!) 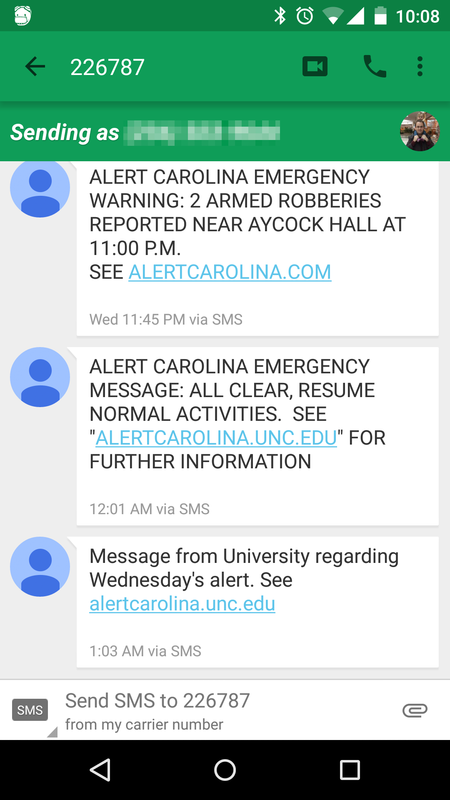 UNC has an elaborate campus alert system called Alert Carolina designed for just such an occasion. The sirens went off as intended. The accompanying email and text message blast did not. Text messages sent by Alert Carolina. Note the incorrect URL in the topmost message. But here’s what is, from the perspective of my work, extra shameful: even when that text message finally went out, it had the wrong URL listed for more information. 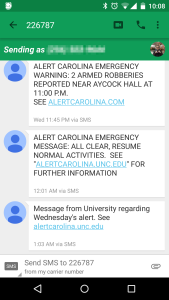 Instead of alertcarolina.unc.edu, it pointed to alertcarolina.com. That .com is held by a domain squatter, and helpfully offers hotel deals. While follow-up messages had the correct URL, none of them acknowledged the initial error. In fact, even the official statement about the delayed message still doesn’t mention the incorrect URL. Have content templates ready to go for emergency updates. This would avoid the incorrect URL problem while still allowing flexibility to communicate as needed. At UNC Libraries we have templates ready to go for when we quickly close due to weather, for example. Have clearly written backup procedures for when a mission critical system fails. These should cover both technical and personnel issues. There are countless campus listservs that could have been used to send a backup notification during those 45 minutes, for example. Or (I’m speculating) maybe nobody was at work who knew how to trigger the alert messages. Staffing redundancy should be built in for something at this level of importance. Build sanity checks into your procedures too, defined review points where someone looks to see if everything’s on course. If something does go wrong, immediately be transparent and open about what happened and what you’ll do to fix it. The vague “breakdown in communication” acknowledgement is not sufficient in this case. Right now I don’t trust Alert Carolina to function in the next emergency situation. Most of this can be boiled down to: Know who is responsible for which content, and prepare for as many eventualities as you can in advance. “Content strategy plans for the creation, publication, and governance of useful, usable content.” That’s it in a nutshell, and in this case Alert Carolina unfortunately makes for a great case study. I’m lucky – the content I deal with on a daily basis isn’t a life and death matter. But that doesn’t mean I can’t have the same level of readiness, at least on a basic level. I’m extremely excited to point out that in a little under a month my book will be available! WordPress for Libraries is written to be an introductory guide to WordPress that assumes no prior knowledge. If you’ve ever wanted to move your library’s website from manually edited HTML pages to something more sustainable and easier to work with, you’ll find the book very helpful. I’ve also included more advanced tutorials like how to display an image collection, using plugins and workflows to help manage your content, and case studies of how many different types of libraries have used WordPress: Academic, Public, K-12, and Special Libraries are all included. I’ve been using WordPress to power this very blog for over a decade, and have worked with the UNC Libraries’ website in WP since 2013. I’ve picked up some tips and tricks along the way, and tried to work as many of them into the book as possible. My book is part of an amazing series, Library Technology Essentials. If you want to learn about Makerspaces, MOOCs, responsive web design, data visualization, and all kinds of other fascinating stuff, there’s something in the series worth your time. And I’m still a bit in disbelief that my name is included with all these other authors. I’ll be giving a copy away sometime in August, so check back if you’re interested. This morning, as I often do, I emailed an ebook file to my @free.kindle.com address to load it onto my Kindle. For the first time in years, it didn’t work. I got no error message from Amazon, and never got the standard email acknowledging receipt of my file either. The file just never appeared on my Kindle. I tried sending it via their Send to Kindle PC application too, and got the same results – my file disappeared into the ether with no confirmation or error message. After pulling my hair out for a while, I noticed that my Amazon Cloud Drive (everyone gets 5gb of storage for free) was full. I piled it full of some last resort backup files six months ago and promptly forgot it existed. When I deleted a few files out of that Drive today, suddenly all my Send to Kindle features started working again. I don’t know if this is a policy change or related to the recent changes to the structure of Amazon Cloud Drive, but I do know my Drive has been full for months. I don’t know why it suddenly started rejecting my files, but there we are. Side note: It’s very poor design for Amazon to not provide any error message in this situation. They could very easily email me about the full Drive, or pop up a message in the PC application. Both options looked like they sent the file successfully. Amazon support was also completely clueless about this when I contacted them. The TL/DR version: If your @free.kindle.com email address or Send to Kindle program has suddenly stopped working and provides no error messages, check if your Amazon Cloud Drive is full. This blog turns 10 later this month. I’m no longer nearly as prolific a writer as I was back then, but I’m still kind of amazed that I’ve kept at it this long. Among other things since then: I got my master’s, moved cities/jobs twice, got married, and had a daughter. Wow. While all 625 old posts are still available in the archives, I implore you to pretend most of them aren’t there. With the benefit of a decade’s hindsight I just see typos, odd sentence structures, weird choices in my URL structure that still haunt me today, and all-around questionable writing galore. There’s one exception: I do want to point out the second post I ever wrote, way back on 12/26/04. I titled it simply “Googlezon”. While I was a bit late to the party at the time, I pointed out an interesting little movie called EPIC 2014. It forecasted the internet and society of 2014, from the perspective of 2004. It’s about 8 minutes long, and still exists on the web in flash format today (remember, this predates Youtube! Ancient history!). EPIC posits a 2014 where Google and Amazon merged (after Google bought Tivo), Microsoft bought Friendster, the New York Times has gone print-only, and more. But buried among these amusing predictions are grains of truth. EPIC’s forecasts of how we generate and consume news aren’t that far off from reality, and it seems to have pretty accurately predicted the rise of Big Data. 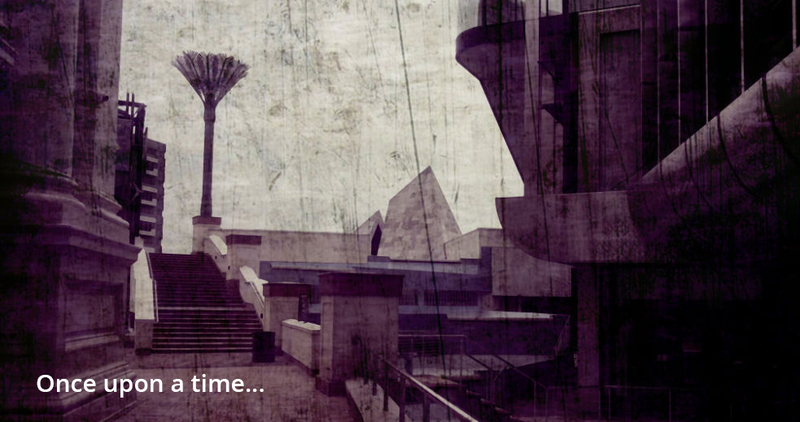 EPIC is a fun look back at where the web was, and where it might still be going. I’ll check in with you again in 2024. The Keylink ($24.99) is billed as a “phone and key finder”. And it works well for that: Attach the small Keylink to your keychain. Lose track of your phone? Push a button on the keylink to make the phone ring. Lose your keys? 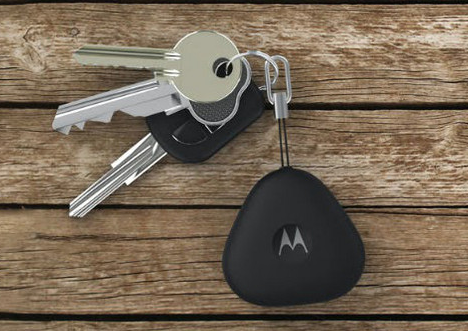 A button in the Motorola Connect app does it the other way around: the Keylink beeps. That’s all well and good, and it works well. But my favorite feature is one that’s getting far less billing. If you’re running Android on the latest version (5.0/Lollipop), the Keylink can let you bypass your phone’s lock code. Lollipop introduced a handy new feature to Android devices, the idea of a trusted bluetooth device. You can tell Android that if you’re connected to a certain bluetooth device (like your car or a home stereo) then there’s no need to use a lock code. If you go out of range of that bluetooth device, the lock code becomes necessary again. Handy while driving, and in a bunch of other situations too. I spend most of my day away from my bluetooth devices, so I didn’t have anything I could use to take advantage of this feature. But the Keylink uses bluetooth! I attached it to my keys, which spend most of the day in my pocket. As long as the Keylink is near my phone, no lock code necessary. But if my phone gets more than about 30 feet from me, then the code snaps back into place. I’ve had a lock code on my phone in the past, but it’s always been a very simple one. I have to enter it countless times per day, so anything truly secure got annoying fast. Now I’m free to use a much more complex code, knowing that I’ll rarely have to enter it. I still wish that my phone had fingerprint-based security like the iPhone, but using the Keylink as a trusted bluetooth device makes for an interesting and convenient alternate method to keep my phone a bit more secure. The Keylink’s battery should last about a year, and is replaceable. Anyone who carries an Android phone and a keyring should find the Keylink useful. Just make sure their phone is on the latest version of Android. The Nexus 4/5/6 all fit the bill, plus a list of a few others that should grow soon. The Keylink is often out of stock on Motorola’s website. But it’s in stock at many T-mobile stores, which also lets you skip Motorola’s shipping charge. The nice people at Optimal Workshop asked me to write a guest post over at their blog. It’s all about mapping the narrative arc onto a user’s journey through a website, an area I’ve been turning over in my head lately. Go take a look! As full disclosure, I was paid for the guest post. 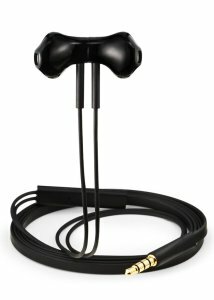 I’ve finally found a pair of headphones that I actually enjoy using: Amazon’s Premium Headphones. As a product category, headphones continually frustrate me. I use them all the time while commuting. I shove them in my messenger bag, fish them out at odd times, and usually end up losing them within a year. I also have relatively small ear canals (according to my doctor), so in-ear types often don’t fit me well or end up hurting after far too little time. I’ve lived with cheap skullcandy in-ear headphones for years, which met some of these qualifications: They’re cheap, have a volume control, sound decent, coil up well, and mostly fit in my ears thanks to coming with different sizes of rubber earbuds. But that fit isn’t ideal, and I’m constantly untangling them. I also own a pair of Motorola S305 bluetooth headphones, for situations where wireless is important. They don’t fold up and are too expensive to replace regularly, but are otherwise a good choice and meet all my criteria. Now I think I’ve found a new favorite pair, from an unlikely source: The headphones that come with Amazon’s Fire phone are nearly perfect! Most of the cable is flat, not round, and relatively stiff. This part of the cable never gets tangled at all. The earbuds themselves are magnetic, and stick together when not in use. This reduces tangles even more. The built-in controls are simple and useful. Tap the button once to pause/resume, or twice to go to the next track. And the volume controls are the first I’ve seen on a wired pair that directly control my phone’s volume, instead of just modulating what’s going through the headphone cable. The earbuds don’t go deeply into the ear canal, meaning they actually fit me. They’re shaped similarly to Apple’s current earbuds, but those always fell right out of my ears. Amazon has slightly tweaked the shape for a more secure fit. 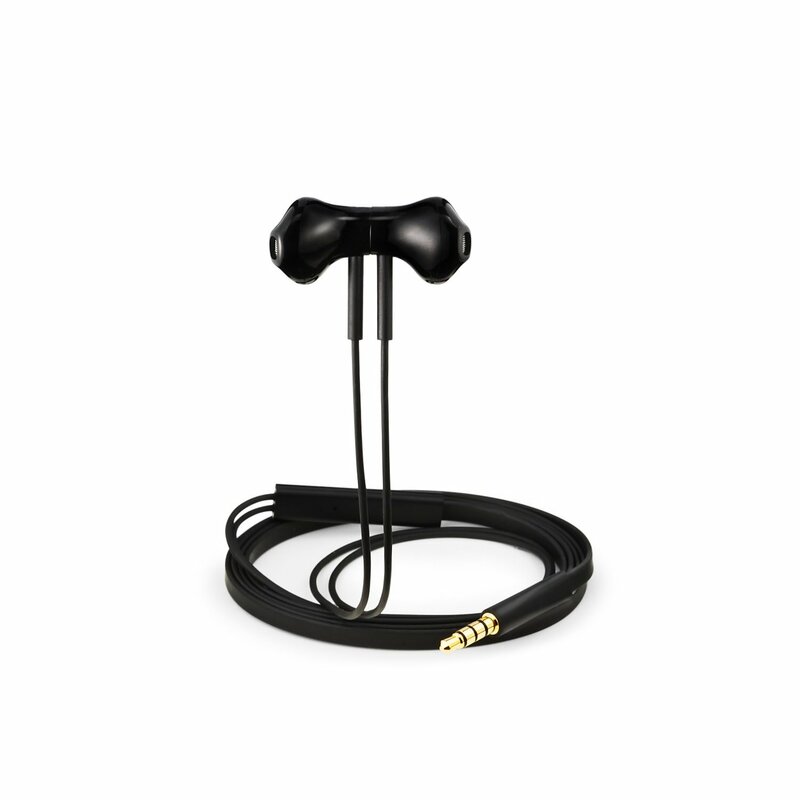 So they’re tangle-free, have excellent controls, coil up well, fit in my ears, sound decent enough, and cost $10-$15. I love these things, even if I’m still a bit confused that something decent came out of the Fire phone’s release. I’d better go stock up on some extras while they’re still available. 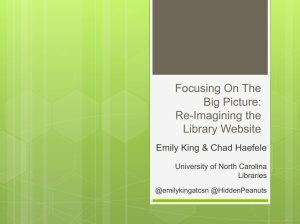 Earlier this summer I gave a talk with Emily King at ALA 2014 in Las Vegas: Focusing on the Big Picture: Re-Imagining the Library Website. 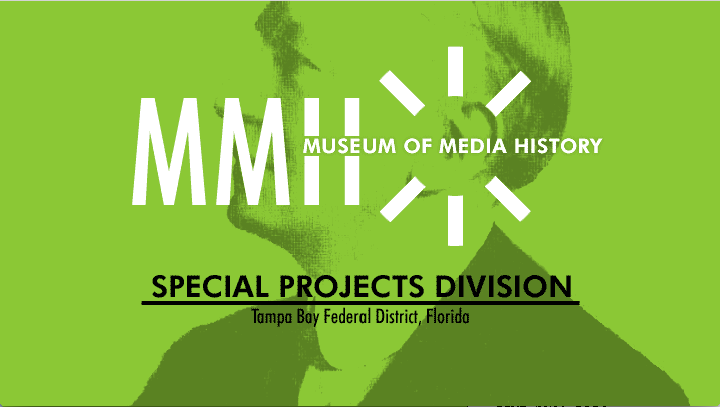 The session was recorded, and the audio and slides are now available online to conference attendees. We had a full room, and some great discussion! We covered our whole website redesign process – how we moved from 20,000+ flat HTML files to a nicely managed WordPress site with a few hundred pages. © 2019 Hidden Peanuts. Theme: Ari by Elmastudio. Proudly powered by WordPress.